When you first have your floor or any stone pieces in your home or commercial building, they look glossy and stain-free. After months or years of usage, they can obtain hard stains, roughness, and dullness. This might be embarrassing when your family or friends come to visit. When your stone surfaces are damaged from everyday activities or improper care, you don’t need to worry because this problem can be fixed using our stones polishing NYC at Statewide Stone Care. The entire procedure of the stone polishing needs several professional techniques and process to restore the true beauty of your stone surfaces. When your stone surfaces are stained, looks dull or rough, the first step we start with is preparation. Preparation is the important part of polishing and restoring your stone surface to their natural beauty. We make sure our machines are working properly, the white tub of the single disk machine if filled with water which is necessary for floor grinding. The water lubricates the floor grinding pads. This is an aggressive method used to refinish the stone surface. A diamond grit heavy weighted floor buffer and a metal-bonded are used to remove slippage and deep scratches. The method is dust free and it is used to help achieve a flatter floor. Honing is less aggressive compared to grinding. Its purpose is to remove moderate etch marks and scratches in as softer manner. Although honing achieves the same results as grinding, materials and grits used for honing are not the same as grinding. Depending on your surface, grinding phase is not necessary, but honing is necessary. After your floor is flat, the next step of restoring your floor natural beauty is polishing. This comes after the honing phrase and sometimes we use a combination of grits compounds to achieve a shiner stone surface after the process. The final stage of our stone polishing services is sealing. This step requires a high-quality sealant which is applied to the surface to ensure it’s protected from contaminants. To ensure proper protection, we do the sealing immediately after grinding, honing and polishing. To achieve excellent results for our clients, we make sure our employees are highly trained and experienced. 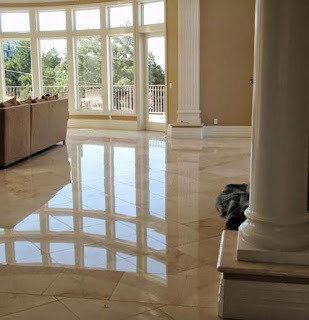 This allows us to provide our clients with quality stone polishing services with great results. Whether you are considering restoring, cleaning or installing your stone surfaces, we will deliver quality and durable stone polishing service to your satisfaction. To learn more about our stone polishing NYC at Statewide Stone Care please call us today at 1-888-574-5595. One of our stone polishing experts will be happy to speak to you.